Electrolux E32AR75JPS ICON Professional 18.6 cu. ft. Freezerless All-Refrigerator has 3 Custom-Design Glass Shelves, Tri-Level LED Theatre Lighting, Smooth-Glide Drawers, Custom-Set Controls and Luxury-Quiet Design. Optional Trim Kit for Built-in Look is available. Electrolux, the Leading European Premium Appliance Brand. Built on a European heritage of innovation, their appliances help you create your home just the way you want it. Explore their sophisticated products, get design tips from their style trendsetters and turn your home into a reflection of you. Their appliances have been in fine homes and restaurants in Europe for more than 70 years. They reflect a design sensibility that is both innovative and intuitive. Sophisticated and efficient. They are proud to bring this thoughtful design heritage to the U.S. with their Electrolux ICON appliances. They fit easily into your personal style while delivering a versatile array of power, performance and functionality to meet your needs. Most of all, Electrolux ICON helps you create the kitchen you've always wanted. A place that welcomes family and friends and nourishes the body and soul. Uniquely crafted for those who are serious about cooking, Electrolux ICON professional series appliances conspire to make you the culinary master of all you create, and Electrolux E32AR75JPS is no exception. Their bold look, expert design and exquisite details give you the confidence to display your gourmet artistry. More space inside to store whatever you need including large platters. The ultimate organization system features Smooth-Glide drawers with removable/adjustable dividers and two mini baskets and Perfect Bins Door Storage. Crisper Drawers smoothly glide out and keep even the most delicate fruits and vegetables fresh with adjustable humidity control and minimal temperature variation. Overall Appliance Depth w/Handle: 29"
Cutout Dimensions without Trim Kit (HxWxD): 72" x 33" x 25 1/4"
Cutout Dimensions with Trim Kit and Leveling System (HxWxD): 75" or 79" x 33" x 25 1/4"
Cutout Dimensions without Trim Kit (HxWxD): 72" x 66" x 25 1/4"
Cutout Dimensions with Trim Kit (HxWxD): 75" or 79" x 66" x 25 1/4"
Shelf Area: 22.38 sq. 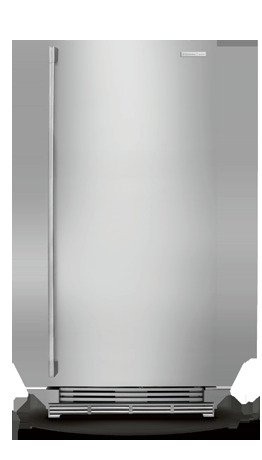 ft.
Electrolux E32AR75JPS ICON Stainless Steel Professional Series is a Freezerless All Refrigerator with 18.6 Cu Ft Capacity. It has Custom-Fit Capacity, Custom-Design Organization System, Smooth-Glide Crisper Drawers, Theatre Lighting and Stainless Steel Finish. Optional Trim Kit for Built-in Look is available separately. Electrolux EI32AF65JS is a 18.6 cu. ft. Freezerless All-Refrigerator with 3 Adjustable SpillSafe Glass Shelves, Luxury-Glide Full-Extension Crisper, IQ Touch Internal Controls and Luxury-Design Lighting. Optional Trim Kit for Built-in Look is available as an option.